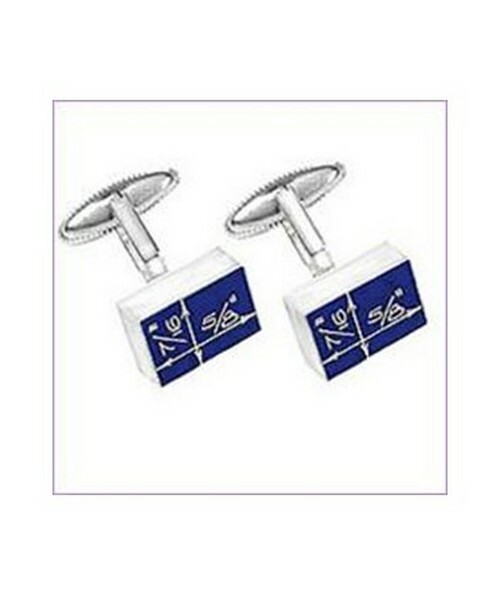 The "Blueprint" Cufflinks make a perfect architecture theme gift for an architect or architecture aficionado. The cufflinks are designed by Constantin Boym who was born in Moscow in 1955 where he graduated from Moscow Architectural Institute. In 1984-85, he earned a Masters degree in design from Domus Academy in Milan. In 1986, he established Boym Design Studio in New York City. His studios designs include tableware for Alessi and Authentics, watches for Swatch, and exhibition installations for many American museums. Boym teaches at Parsons School of Design in New York, where he is a coordinator of the Product Design department. Made of silver-plated cast alloy with enamel inlay. Dimensions: 5/8' x 3/8".